The Solar and Heliospheric Observatory spacecraft captured this view of an Earth-directed coronal mass ejection erupting from the sun on Sept. 30, 2013. A powerful solar explosion slammed into Earth's magnetic field late Tuesday night (Oct. 1), ramping up the northern lights across parts of Canada and the United States. The sun storm erupted on Monday (Sept. 30), sending a huge cloud of charged particles streaking into space at incredible speeds. That cloud — known as a coronal mass ejection, or CME — hit Earth's magnetic field at around 10 p.m. EDT on Tuesday (0200 Wednesday, Oct. 2 GMT), researchers said. NASA released a video of the sun eruption on Monday, before closing down for the current government shutdown. "G2 (moderate) levels of storming were observed overnight as a result," officials with the Space Weather Prediction Center (SWPC), a service of the National Oceanic and Atmospheric Administration, wrote in an update Wednesday (Oct. 2). "Earth remains under the influence of this CME, so there is likely still more to come." 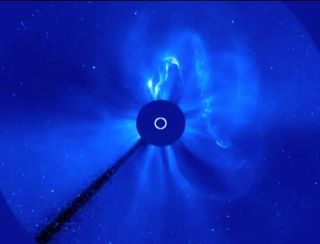 G2 geomagnetic storms can cause voltage alarms in high-latitude power systems and knock orbiting spacecraft out of their preferred orientation, requiring intervention by ground controllers, according to the SWPC. Such storms can also cause the northern lights to be seen as far south as New York and Idaho. Flare-ups were indeed seen in North America as a result of the recent CME impact. "In North America, auroras spilled across the Canadian border into more than a dozen northern-tier US states," astronomer Tony Phillips wrote today on Spaceweather.com, a website that tracks skywatching and space weather events. "The storm has subsided now, but it could flare up again," Phillips added. "NOAA forecasters estimate a 65% chance of more polar geomagnetic storms as Earth passes through the wake of the CME on Oct. 2-3." The sun is in the peak year of its current 11-year activity cycle, which is known as Solar Cycle 24. The number of sunspots increases during a solar maximum, leading to more solar flares and CMEs, which erupt from these temporary dark patches on our star. The sun has been quiet during its current cycle, and the peak has been lackluster so far as well. In fact, scientists say Solar Cycle 24's maximum is the weakest in 100 years.